This page contains the strategy on How to Defeat Jedah in Chapter 5 of Fire Emblem Echoes. We will be updating this as we go along. This article contains the strategy on How to Defeat Jedah in Chapter 5 of Fire Emblem Echoes. It includes a breakdown of Jedah’s Skills, their effects, and the Boss Strategy. A black magic that has the following attributes: Rng 1~3, Mt 14, Hit 70, and Wt 9. An enemy only white magic spell that summons monsters to fight for Jedah’s side. Recover 5 HP every turn. Ignores range and deals a counter. Calls upon the power of Duma to prevent the enemy from performing a counter. Grants immunity to status ailments such as paralysis and poison. Does not consume HP when casting Magic. Ring that amplifies grudges and extends the range of black magic. When Jedah activates his Skill Duma’s Protection, he becomes invincible except for every 4th character that deals damage to him. Thus if all 8 characters focus on attacking, you can deal at most 2 hits each turn. If your character can double attack on the fourth turn, this tactic becomes more effective during combat. Bear in mind that if you have played the original title Gaiden, this element differs from the it wherein damage was not based on every fourth character’s move, but on every fourth turn. Whenever Jedah uses Recovery Effect in tandem with Conjure, it enables him to replenish his HP by 10 each turn. Thus you must prepare your damage dealers to effectively manage his HP absorption. Another thing to be wary of is that Jedah negates grid distance and thus can perform Grudge to counter even units who deal Ranged attacks from at least 2 tiles. Clear the path off Mogalls first using your units armed with Blessed Weapons and Seraphim. 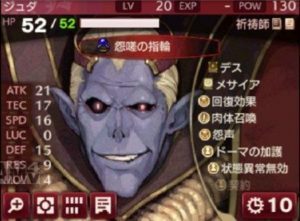 Then charge at Jedah with high RES, high ATK units to sustain the magic that he casts. Dread Fighters make suitable choices and this includes the illusory soldiers (Dread Fighters) that Silque casts. First have the illusory soldiers deal the damage, then on the 4th attack, have one of your Dread Fighters deal the damage to inflict a fierce attack. It is better if the 4th attacker has higher SPD than Jedah in order to chain a counter. Gather all hard-hitters to deliver some massive damage. Another fitting unit to at your disposal is Alm equipped with the Royal Sword as his Double Lion becomes effective in this battle. To illustrate, at normal difficulty, it is sufficient for Alm to have at least 29 ATK during this battle to effectively shave off heavy damage. A combination of using the Sacred Springs alongside some items should support Alm to reach this potential. During the battle against Jedah, it is essential to have his support allies cover the adjacent tiles nearby Alm in order to provide not only Heals but also buffs that heighten his Critical hit rate. To minimize the chance of accidental kills, prepare Mila’s Turnwheel for contingency. Apart from Alm, another valuable team-up Skill is the Triangle Attack which is a Skill unique to the Pegasus Sisters: Catria, Palla, and Est. It requires that you have the enemy backed up in the corner and have it surrounded with the 3 units to perform.